Please ring or text me on my mobile 0416860940 or send me an email. Absorbs or draws moisure away from the skin keeping you dry and comfortable. SPF 45+ fabric designed to block UV A and B rays. What is the difference between a Compression bra and a Support bra? A Compression bra has padding and Technologically advanced fabric at the cups bottom and side supporting high impact movement. The padding can be removed from the bra if you prefer a smoother line.You can choose to wear or not wear a bra under the compression bra depending on the amount of support you prefer. A Support bra does not have any padding and adds a little bit more support to your bra. It is very important to refer to the size chart. Take a moment to measure yourself. See below for chart. As a guide a Extra Small is like a 6-8, Small 8-10, Medium 10-12, Large 12-14, Extra Large 14-16 and Extra Extra Large 16-18. 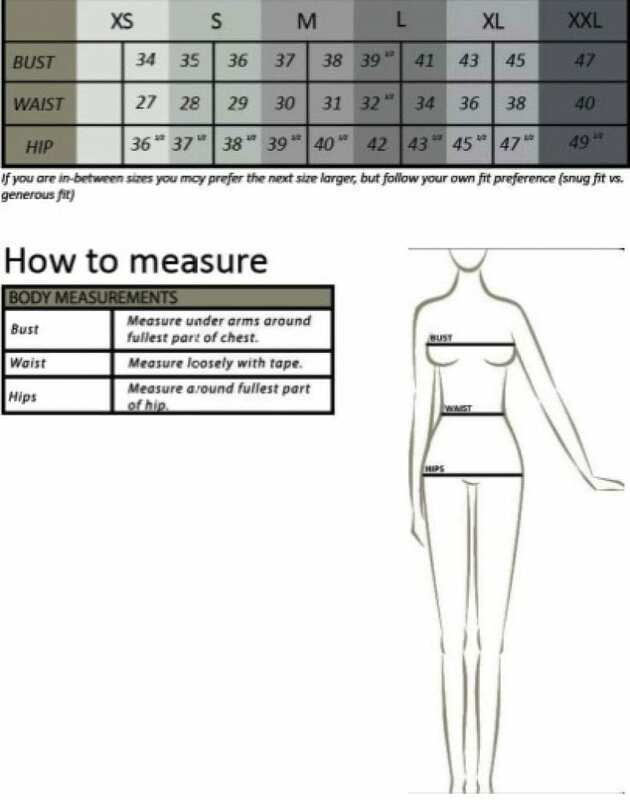 If you are for example a size 8 and like your clothes to be fitting or Athletic fit then choose XS 6-8. If you like a more comfortable fit, not as fitting a classic fit choose Small 8-10. Once your order has been received it will be processed by the next business day except Weekends and Public Holidays. All orders are sent by Registered Post, allow 1-5 working days. Orders are only available within Australia and not delivered overseas. Parcels 0-500grams cost $10.00 to ship anywhere in Australia. Parcels 500g-3KG cost $15.00 to ship anywhere in Australia. Parcels over 3KG do differ from State to State and will be advised at time of purchase. Does the Skirt have Shorts under it? Skirts with shorts will be specified. If it is not mentioned it will not have the shorts attached. Under shorts can be purchased separately. Do Dresses have shorts attached? No. Dresses do not have the shorts attached. Under shorts can be purchased separately. The customer is responsible for the additional postage costs involved in returning or exchanging the product. All returns will not be approved until the items have arrived and been inspected. All original tags must be attached. For more Answers please use the Contact Us page and make an Enquiry.